Beginning with Pega® Platform 7.3, the Decision Analytics work area for data scientists has become an integral part of Pega Platform. This new work area for predictive, adaptive, and text analytics gives data scientists full control of the model life cycle. 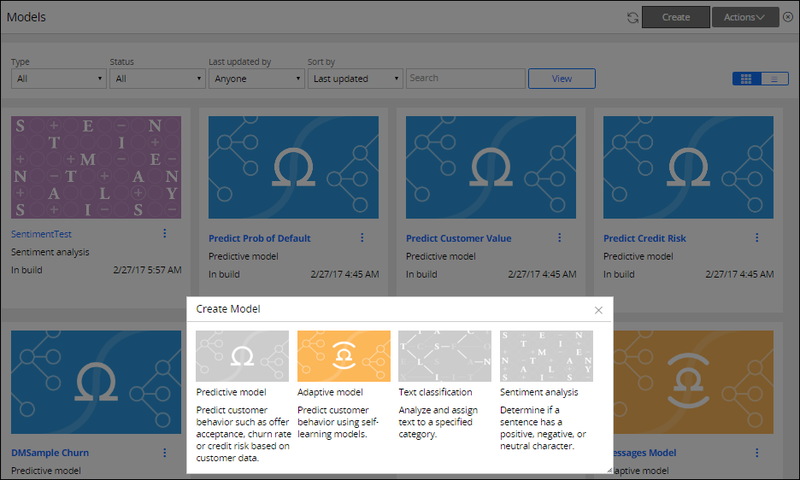 Data scientists can access all the new features of the Decision Analytics work area through the Decision Analytics portal in Designer Studio. For more information, see Decision Analytics portal. In general, data scientists have technical knowledge of Pega Platform and expertise that helps them to understand customer needs and create models. With the intuitive design and maintainability of the Decision Analytics work area, data scientists do not need to be programming experts. In terms of predictive and adaptive analytics, the new Decision Analytics work area becomes a single place where you can develop, update, test, and monitor all types of Pega Platform analytical models. You can build or upload predictive models that analyze the past behavior of your customers and their profiles so that you can identify patterns, risks, and opportunities. You can create and configure self-learning adaptive models to improve predictions about how customer interests and needs change. In the Decision Analytics work area, you can also train, test, and build text analytics models for classification and sentiment analysis. The models can enhance the quality of text analytics in your application by detecting syntactic and semantic features and patterns that drive sentiment detection and category assignment, based on the training data provided. When a model is built, you can download it as a JAR file. You can also save it as a Decision Data rule to upload as part of a Text Analyzer rule in your application. For more information, see Predictive Analytics, Adaptive Analytics, Text Analytics.